Craning a Launching Alternative for Some Clubs….?? We had some chatter on the Blog recently about the attraction that cranes might have over slipways at some Clubs. Indeed, to my surprise, we did find a few UK Clubs who crane already. For Dragon craning, we had pretty big bits of crane which cost serious money – and would be too much for many FF Clubs to consider. And so I was delighted when Richard Blaquiere wrote in from Perth W.A. …. I’ll try and get a picture of the FF crane at Freshwater Bay. I’ll also get some basic measurements. Height of the boom of the ground, and its length. I did a design of a small ff15 crane for our club, before they built the new facilty. It was very simple, similar to the small cranes they use to lift dingys off large boats. Remember a heavy 15 is 350 kgs. on weight 15 is about 315 kgs. Have a look on EBay for a small material lift, that has SWL (safe working load) of about 750 – 1000 kgs. 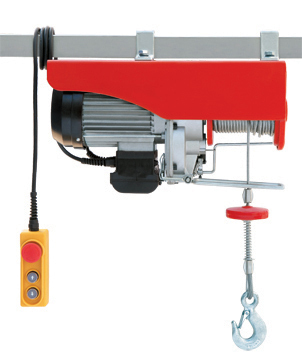 The material lifts need 240v single phase power. ie stand power point. They all usually have a hand held pendant that controls the up / down of the hook. They are very cheap in Aust. I would think they also quiete cheap in the UK. The design I had done used one of these material lifts. The gantry was made from 150 x 50 x 3 RHS, and the base swivelled on a Wheel hub and a stub axel. All hot dip gal after fabrication. I’ll see if i can find the sketch that i did. 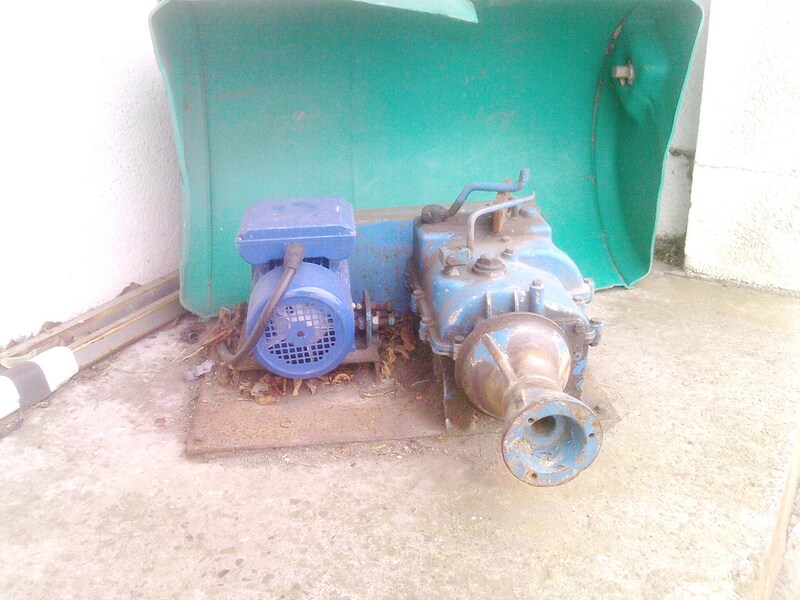 Richard also pointed me at the type of motor that an FF crane would need. I was amazed to see that we’re only talking a couple of hundred pounds. This is what they look like… not large at all. Tornado Hits Hayling Island – Importance of Tying Down….!! We have a rule at our Club that all parked boats should be tied down. I don’t suppose for a moment we have 100% compliance to that rule. It’s not a rule just for dinghies, of course. You’d think an FF was heavy enough to be secure probably. 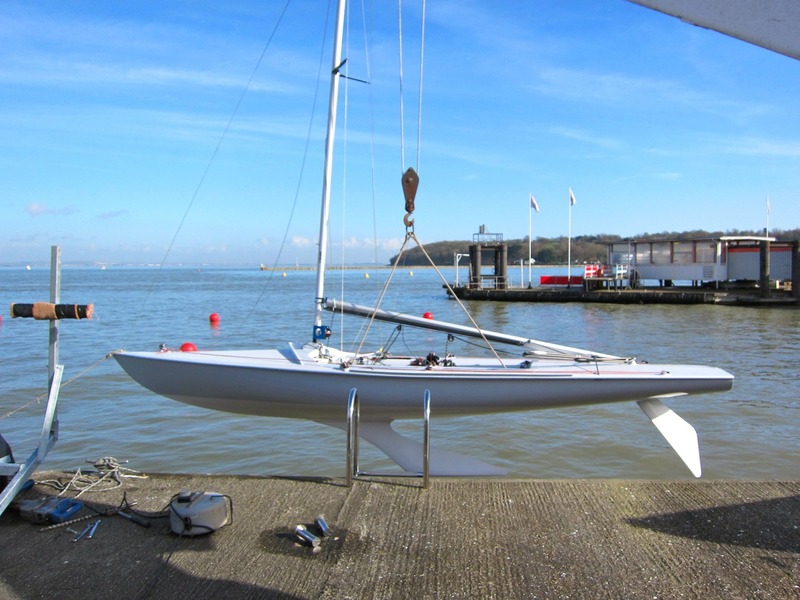 When I had my first brand new fifteen, I had the nose of the boat lift out of the trailer support in a gale – as a result nowadays, I always tie the nose in when parked. Around about ten years ago, in the Datchet Winter Warmup, we had Brett Dingwall’s Fifteen blow clean out of its trailer and bounce down the slope below…. those of you who helped carry it back up will remember. So we never forget to tie our trailer down when parked. Electric Slipway Winch at Cardiff Bay YC…..
Slipway Winching – the View from Draycote…. Some other thoughts on moving FFs. How about one of these – http://www.shifta.com/ not sure if they are still available new but you can pick them up second hand. This one also – http://www.parkit360.ca/pricing/p360l/eu-uk-az-a-nz.htmlQuite slow but then so is winching. Also, modify an electric wheel barrow – http://www.easybarrow.co.uk/powered%20equipment/big_page_PPP01.html . All need a 50mm ball hitch . Also how about a small garden tractor? Winching seems very inflexible. Slipway Winching at Cardiff Bay…. We have a winch here at Cardiff Bay Yacht club, no problems at all, it goes through a pulley that is on a ring set in the concrete slip. 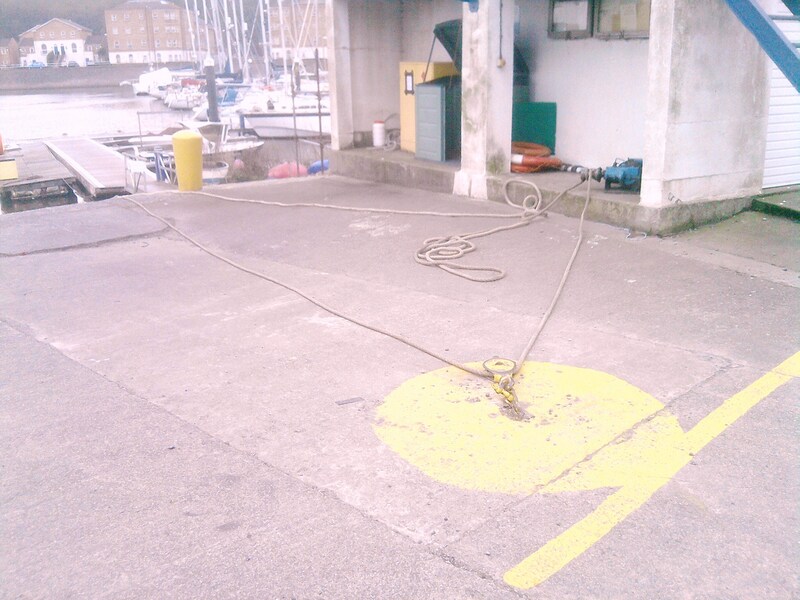 No problems with people on the slip, the rope moves quite slowly. Saves a lot of hard work and tyre rubber ! So you have bought your first Flying Fifteen… you won the race, first time out… and you just cover it up and roll it into the berth until next weekend…. Right? Your lovely new boat spends most of its time parked up. So are there good ways and bad ways to go about berthing….??!! – have you taken the hatch covers off to air the tanks? – Charles Apthorp told us to always tension the rig when you park. Tighten up the forward halyard maybe, or at least set some pre-bend. The rig moves around a lot in the breeze while parked unless it is a little taut. This leads to wear at the gate and critically at the heel. So tighten it up. – a whole number of the ‘old hands’ use a sacrificial line that runs up to the hounds from the furler drum on the spinnaker halyard. There is then no halyard left in the damaging UV rays from the sun. Perhaps more importantly, if your boat has bags and uses a flyaway for the halyard tail, you dont want to be parked with the shockcord taut. It ages it terribly. It’s a simple hitching post. You’ll notice that this one has a cheap height adjuster to get the draining level just right. Beware of the rudder tip when you are using a post like this – some of ours need a little trench dug under the rudder tip to stop it touching as you hitch. 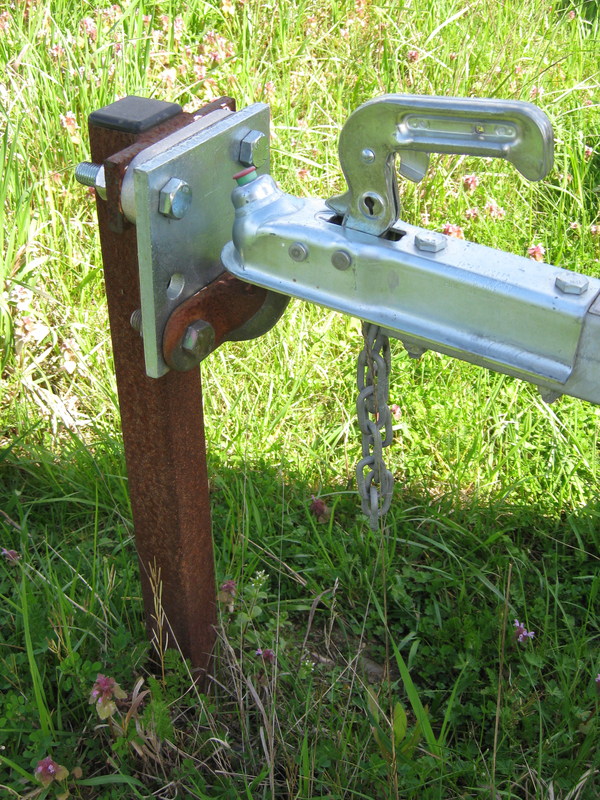 A hitching post also enables you to take your jockey wheel home out of thieves way. We’ve had a couple disappear in 15 years, but it is rotten when it’s yours. We did have a period when our Insurance said we had to lock the hitches for security. It means much more if you are able to lock it to a hitching post. – The VC, ever the perfectionist, also wraps a piece of old towelling around the mast at the point that the cover makes contact. At Datchet our air contains a bit of kerosene from the Heathrow traffic, and this stops it running down the mast in the rain, into the cover or the boat. – don’t forget the club rule about tying the boat down. I know it seems unlikely but my first FF had its nose blow out of the V support in a gale which was a bit of a shame. So at least make sure the nose is secured to the trailer somehow, and I also tie the trailer down to the ground, and padlock it.